From the Warp: The return of Herohammer? 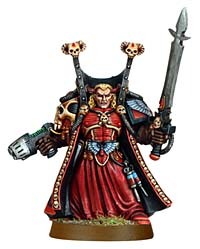 Well, fellow gamers, we stand on the brink of the new Blood Angels release and one thing a lot people are talking about is Mephiston, Lord of Death and his legendary stat-line. Previously consigned to the whimsical musings of Primarch Rules Development threads and named Daemons Mephiston's unique stat-line appears to the next step in an evolutionary process many have come to refer to as "Herohammer". The word gives a name to the new trend of powerful single model HQ choices that not only dominate a large percentage of your force's points cost but also include exceptionally powerful stats and special rules. Thus emerges the idea that Warhammer 40k may yet devolve into a kind of game in which HQ choice battles HQ choice with little regard for supporting models that can only look on helplessly; outclassed as they are by pricy but powerful characters. 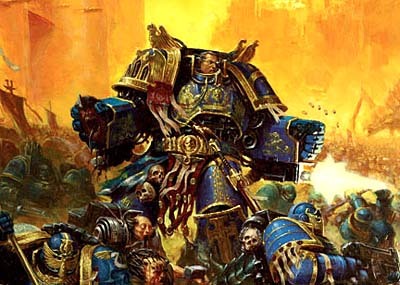 Priced at more than a Land Raider in his signature suit of armor the Master of the Ultramarines is a re-inventon of precisely what Marines are capable of in hand to hand combat. By adding Calgar to your army you trade in a substantial amount of points and in return receive a unique army-wide special rule and a unique FOC. One of the most expensive entries in the entire Imperial Guard codex by himself Yarrick belongs in this list of uber-characters because he follows the design mentality of an expensive character that changes the way your entire army works. With strong buffer rules, the ability to come back to life on a 3+ and more weapons than one man could possibly carry on his person Yarrick is a far cry from what anyone might have expected given the previous codex's HQ-choice power levels. More than perhaps anyone on this list Yarrick feels as though he belongs to a 2nd edition codex where the super-HQ was King. 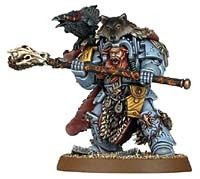 The Space Wolves codex is filled to bursting with Hero-character worship. All of these characters promote an infatuation with the heroic figure backed by an unhealthy reliance on said minis' performance. Woe betided any player unlucky enough to lose any of these characters (or even just their transports) early in the game. A brutal close-combat fiend and a heap of points. Players that face the Swarmlord menace have two options: fire EVERYTHING at it until it dies or mirror the Swarmlord's every move with their own Deathstar unit and hope the dice favor them. As mentioned above Mephiston has reshuffled the 40k stat-line. He's a reminder that though GW has, until now, chosen to remain within the familiar range of the '4' heavy stat-line that this could change at any moment. He is the epitome of "Herohammer" - the single named character that can affect the entire game through brute force and massive psychic potential. So what does this mean for the game of Warhammer 40,000? It's clear that HQ choices will continue to, not only play a pivotal role in the game itself, but add another dimension to the strategic planning that goes into army design before the game. Competitive players will need to watch their local meta-game closely. If your gaming community has chosen to embrace this new race of special 'special-characters' then you will have to respond in kind. Gamers that are using newer codicies can play "Herohammer" because their codex will likely contain powerful counters to other named HQ characters. However, older named characters will likely flounder in the face of fresh IC's (compare Inquisitor Corteaz to the similarly priced Vulkan He'stan). Thus players with older armies will need to favor mobility (in order to avoid threats they can't deal with) or multiple disposable squads that can delay an oncoming assault leaving the foe's elite unit out in the open. Of course "Herohammer" need not be a death-toll for older armies. With the FOC changing potential of new characters older armies may find a new home through the wonderful rule of 'count-as'. A great example is Logan Grimnar standing in for Belial and Sammael giving those poor Dark Angels players the ability to field their Doublewing armies with only minor adjustment. In addition, the widespread focus on named characters will give players a chance to differentiate their armies with unique and characterful choices. An example in this case would be an Ultramarine Tyranid Veterans force led by Chaplain Cassius. Should the "Herohammer" trend continue it will be interesting to mark changes in 40k tournament rules. Will 40k abandon special characters, as WHFB already has, in favor of choices that are more tournament oriented? Could special characters shake the balancing act that is 5th edition forcing unwritten rules on players as to what characters are legal and which are broken as exist already in Lord of the Rings? John Venegas' recent article on Character Defined Armies gives a good account on the sudden emergence of crucial special characters citing GW's promotion of said unit as being due to the existing model range. In other words, while GW gained nothing from the old Space Marine Trait system (not directly anyway) they do benefit from our purchasing a Calgar model to lead an Ultramarines skirmish-level force. We can therefore expect for this trend to continue as long as it is profitable for GW. For my part, I find the recent influx of powerful characters to be of little import. The additional power of characters rapidly declines after the 200 point mark and though many, especially those with an area of effect, will be unavoidable the majority of armies will suffer when too many points are shoved into too few models. The physical restrictions placed on these characters is significant in the sense that one special character can only occupy one small part of the board. That is to say Grimnar, though he costs the same as two Wolf Lords, does not share the latter's ability to create double the threat radius. In contrast, the two Wolf Lords are only marginally worse in close combat. These physical limitations will be doubly felt in missions that focus on killpoints rather than objectives because the opposing force's mobility will not be hampered by the need to contest a certain spot on the table. As for actually using special characters I will always tend to favor those that make my army unique, preferably by changing around the FOC. When I design my own characters I try to focus on how their background might be expressed through their special rules. I consider one of the most important elements of character design to be the existence of an actual choice with respect to other entries. For instance though the Eldar codex has a large number of special characters it is usually only the very effective Eldrad and Yriel that are chosen. More recent codicies address this issue well with perhaps the best character choices belonging to the Orks codex wherein each character boasts colorful, fun-to-use rules and is generally competitive. Army Building, do you build what you want to? Only 4 of the characters you've mentioned are any good. Ghazghul Thrakka, Eldrad Ulthuan and Vulkan He'Stan are the most devastating special characters. The only thing that bugs me is how special characters are now more cost effective than regular characters. We're not into hero hammer by a long shot, although it's nice to see a lot of new miniatures for them being released. I've only recently gotten back into 40K, slowly building an army up, haven't played any. Last time I played was 1997, right near the end of 2nd edition. I had Blood Angels and Eldar forces back then. Just wanted to throw this out there: when I was playing in the 2nd edition days, invariably the first rule at tournaments was "No named characters" usually followed by "No assassins." 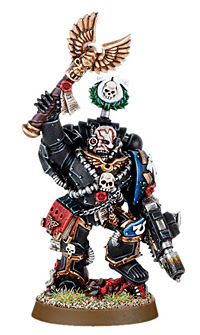 I had a Mephiston model back then, and he sure was pretty, but I never got to use in except in games with close friends. Do you think we'll go back to that over the next few years? I think it would be a wise direction to take tournament play, as it rewarded skill and thinking rather than point and click solutions. werent the old rules much like this? WS of 7-8 were the norm for anyone who wasnt the standard troop. @Adam: I tried to avoid a discussion of which characters were good or "worth their points." I wanted to focus more on the inclusion of high profile entries in the latest codecies. Whenever you spend 10% of your points or more on a single model you're approaching the "herohammer" concept IMO. @Thomas: The exclusion of special characters is something I mentioned in the article but may not be feasible anymore. This is because many armies' personalities revolve around the inclusion of certain characters (i.e. Salamanders - Vulkan, White Scars - Khan). Also not all "Special Characters" are guilty of being over the top. Will we get rid of Bastonne just to exclude Vulkan? 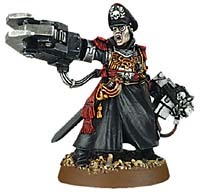 @Vandalworks: Yes it used to be that even an Inquisitor Lord had similar stats to a current Phoenix Lord circa 2nd ed. "Herohammer" is largely a return to that style of rules design. Atrotos, most characters cost 150pts which is 10% of 1500pts armies. Do you mean 20% as this would be around 300pts? The most salient point in the article is the popints spent versus model count. Yes you could take hihg point characters and fill in the rest of your army as bets you can. But will you be able to achieve missions? That is what it really comes down to. Like taking three monoliths and the nightbringer. Unless you play very cagey - and make the game no fun for your opponent - chances are you will be phased out. 40K will never sink low enough for Herohammer to become a serious issue for game balance. A balanced all comers list with a high cost Special Character is no better than a balanced all comers list with non Special Character. The Special Character CHANGES the way the list is played but they will not changed the balanced of the entire 40K gaming universe... they will change the tactics used to beat a list. It is similar to taking TH/SS Terminators in a LRC... they are very dangerous for the points spent on them but they do not make a list unbeatable. On the contrary taking the TH/SS Terminators in a LRC can be a bad thing in some lists. If the list is not balanced correctly the expensive units become a weakness that an opponent can use to their advantage (e.g. tar-pitting the expensive unit with a popcorn unit while picking apart the rest of the army). C Trudden looks at another issue that taking high cost Characters have on the balance of a list. Do they have the points to take the necessary troops or even the necessary support elements like long range heavy weapons. It will be gamers that take Internet Lists into casual games that will give rise to this trend of gamers thinking Special Characters are unbalanced and unfun. I enjoyed the article even though I don't agree that powerful Special Characters = Herohammer. I personally like the way the chaos space marine codex handles characters - there are a lot of very solid characters there, but many of them don't "own" or "define" the game, and building a list around (e.g.) Lucius is simply not as competitive as it is with (e.g.) Vulkan. Overall, a good read, but I find that the improved mobility of units in the game makes it much harder for such 'ubermensch' to have the reach and inflict the damage required to really justify their presence. Mephiston may be an exception, with his flying etc, but he does not have the IC rule, and thus is very vulnerable to enemy fire. @MoD: Perhaps it won't affect the balance of the game in the conventional, competitive sense. I don't believe these super-characters are overpowered. It will however change list design and tactics which is another definition of balance. What bothers me is the unnecessary addition of special characters where a simple upgrade will do. Why "Tank Commander Pask" and not simply "Veteran Crew?" Why isn't Bastone more like a Broodlord - available everywhere? This is the only reason I'd like Special Characters phased out. @jabberjabber: Don't forget the Chaos codex is not a 5th ed. codex. GW has undergone significant overhaul in rules development making named characters a much more vital part of every army since around the Ork codex. @The King Elessar: As much as I would have liked to discuss the RETURN to Herohammer I did not experience 2nd edition. Thus I've only 'tipped my hat' to the bygone age and described Herohammer as it exists in the latest edition. I promise that given an opportunity to write about something closer to rules development you'll find my article much more comprehensive. characters can be powerful, but can be dealt with in most cases. as good as someone like meph or the swarmlord is, shooting will bring them both down, costing the opponent a sizeable amount of points wasted. in 2nd ed, SCs could wreck most of an army before being laid low; not the case with todays characters unless the dice really swing in your favour. I'm new to the hobby, but to me it seems more like a push by GW to get everybody playing at a 2000 point range, rather than these more unbalanced 1250 & 1750pt games. It's hard to write things you don't know. I'll take up your invitation and check your blog for more stuff, certainly if it's as good as this read was I'll be happy to have it on my reading list. I want to thank everyone for the excellent feedback on this thread and those took a moment to check out RM. Thanks too to Ron for the face time on the page, I'm looking forward to writing for FTW again in the future. Mephiston is not even an Independent Character, he can't join units or be joined by other Independent Characters. He can't take a dedicated transport, he costs as much as a Land Raider by himself so with a transport he costs way too much and he'll die to persistent shooting just like anything else. IG Veteran Squad with Plasmaguns? Yes. Lascannon Predators? Yes. Eldar lances? Yes. Pretty much anything the Tau or Necrons can shoot with? Yes. You can actually even just tie him up with a Space Marine dreadnought and ignore him. Is his statline good? Yes. Is he useful? I doubt it. I would've actually asked for a less uber Librarian that can join squads. As he is, I doubt he'll be fielded much if at all.